By the time ‘Chatty Chatty’ was released in 1980, reggae seemed mainstream, at least to us collectors. Although the occasional US ska or reggae radio hit of the 60′s had long ended, and it’s resurgence in the 90′s still being a ways off, college stations were playing it pretty heavily. Plus the touring acts would hit all the punk and new wave clubs, drawing primarily the same audiences. If ‘Chatty Chatty’ sounds similar to Bob Marley & The Wailers’ ‘Could You Be Loved’ it’s not surprising. Chris Blackwell produced both in that same year. 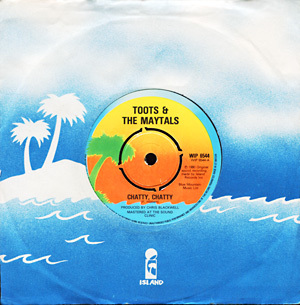 On first listen I was convinced Toots & The Maytals had a mainstream smash on their hands, at least in the UK. Wrong. It never charted. None of his singles did. Seems hard to believe. ‘Chatty Chatty’ serves as the perfect springtime single, April 7, 1980 being it’s exact release date. That was something I learned from Chris. He many times saw a song’s first listen as being seasonal. Toots was spring and summer, Marianne Faithfull definitely autumn or winter. This entry was posted on Saturday, April 21st, 2012 at 12:01 am	and is filed under Bob Marley & The Wailers, Chris Blackwell, Island, Marianne Faithfull, Toots & The Maytals. You can follow any responses to this entry through the RSS 2.0 feed. Responses are currently closed, but you can trackback from your own site.